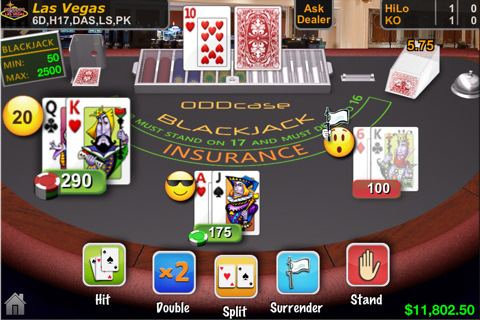 ODDcase Blackjack is a gaming app that brings blackjack to your iPhone, iPod Touch, and iPad. If you can imagine sitting at a blackjack table with an unlimited supply of money then you can imagine playing this game. It was developed by ODDcase Software Inc. and costs $1.99. I have never been to Las Vegas or gambled anywhere for that matter, but ODDcase Blackjack piqued my curiosity. I cannot stop playing this app, which is a clear indicator that I should abstain from gambling. It does not help the addiction that when you play this game there is no monetary limit. When your cash gets low, which is anything below $1,000, you get to ring for another $1,000. There are two other players on either side of you that you can control. You choose how many players you want in any given hand. In the game play, you get a choice of Hit, Double, Split, Surrender, and Stand. 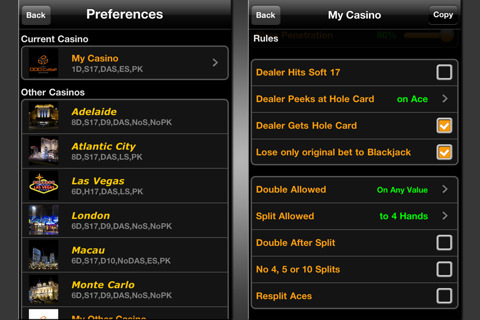 In Preferences you get to choose the city of your casino from Las Vegas, Adelaide, Atlantic City, London, Macau, and Monte Carlo. Each of these cities has different rules for blackjack so the game play differs between the 6 choices. The specific details pertaining to the game rules of each city is in the Preferences section. When you go to the Home page you get Preferences, Statistics, and Basic Strategy. In the Statistics section you get the run down on your winnings, hands, plays, and an analysis and strategy. Even though before I took a good look at the statistics I thought I had won most of my rounds, my Winnings totaled -$5,012, which is just another reason I should stay away from Las Vegas. The minimum amount you can bet at the table in any given round is $5 and the maximum is $250. You have $5, $25, $100, and $250 chips in front of you to bet with. AppSafari review of ODDcase Blackjack was written by Vanessa Paszterko on November 21st, 2010 and categorized under App Store, Fun, Games, Strategy. Page viewed 4519 times, 1 so far today. Need help on using these apps? Please read the Help Page. Whenever I try to submit my app (Covers of Spider-Man http://itunes.apple.com/us/app/covers-of-spider-man/id404527304) I get a message like “No verification code generation”, even though I did enter the Captcha… I get the same when trying to use the feedback form… please help, thanks! Same problem as Philipp Lenssen. When i try to submit an app, says there is no verification code gen. Help plz!